On Saturday, February 17, Hook’s Cheese will be providing samples of some of its many great creations in the Fromagination shop. 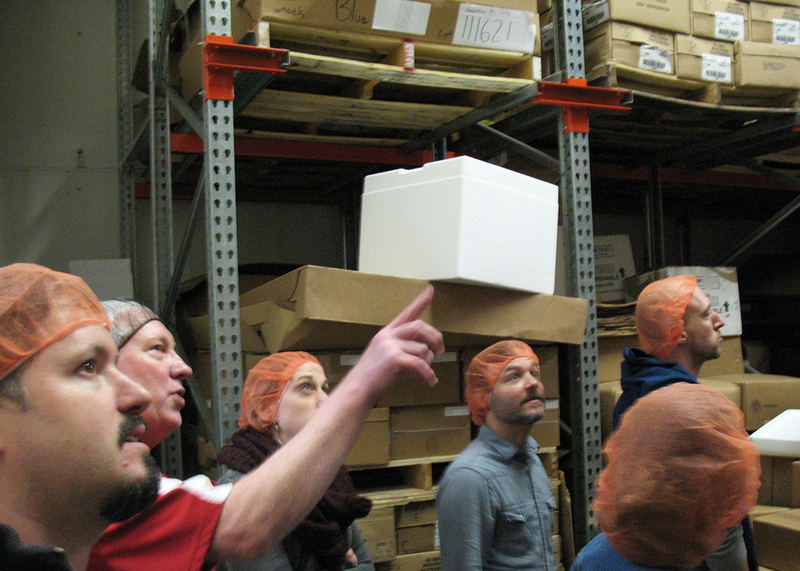 Tony Hook, pictured in this photo giving Fromagination employees a tour of his cheese warehouse, has been making wonderful Cheddar cheeses in Mineral Point for many years. One of our best sellers is Hook’s 8-Year Aged Cheddar. One mixed milk cheese from Hook’s – Triple Play – will be sampled that day. It is a cow, goat and sheep milk cheese that displays flavors of a Gouda, baby Swiss or Havarti. This version, Triple Play Extra Innings (get it?) is aged for more than 12 months to bring out a fuller Gouda flavor and allow crystals to begin forming. Hook’s also features a series of Blue cheeses. Hook’s Original Blue, a Danish-style Blue cheese, is very popular. But Little Boy Blue, which won First Place for Blue cheeses at the 2016 American Cheese Society competition, will be offered for sampling on this Saturday. It is a sheep milk cheese, similar in style to a French Roquefort cheese…also made from sheep milk. Visit us on Saturday, February 17, to sample some great cheese…and learn more about the successful cheese production that Julie and Tony Hook began back in the 1980s.